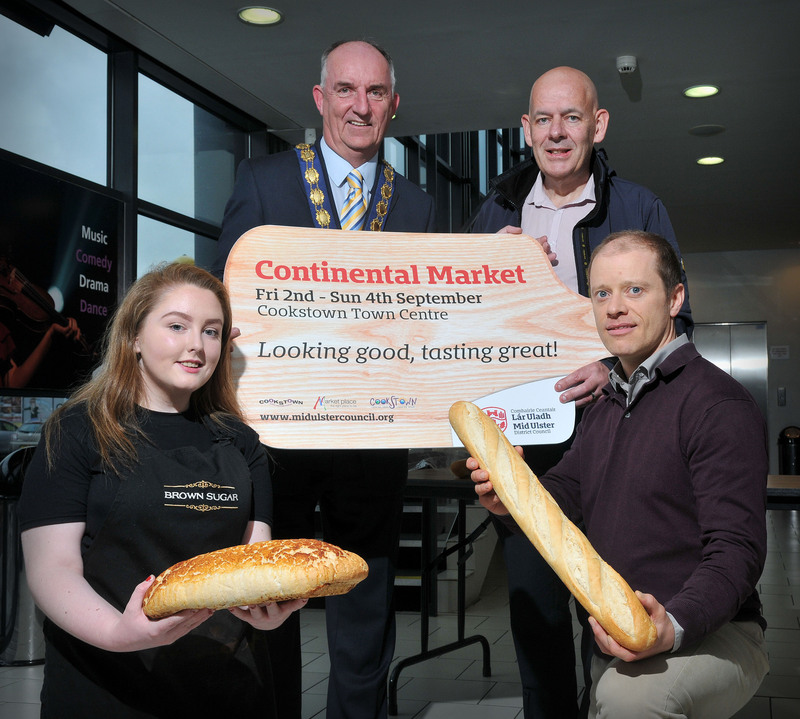 Cookstown will be ‘looking good, tasting great’ for the 2016 Continental Market, as the town gets ready to mark the completion of the public realm scheme and to celebrate the Year of Food. Taking place from Friday 2 to Sunday 4 September, the market is organised by Mid Ulster District Council and this year foodies will not only get the chance to sample cuisines from all over the world, but also a flavour of the best of local produce, with a showcase of local food and a series of cooking demonstrations. The weekend-long event will ensure children are entertained and also feature music, with performances in the town centre on Friday and Saturday evenings, and a stage for local talent on the Sunday afternoon. “Given we are celebrating Northern Ireland’s Year of Food, I’m delighted that, as well as getting a flavour of food from around the world, the quality of our own local food will also be showcased to the thousands of visitors who flock to the market over 3 days. “This is also an excellent way to mark the completion of the multimillion pound investment in Cookstown and its ‘new look’ town centre and to say thank you to our businesses and residents who have shown nothing but patience and cooperation as the work has been going on. “It really does promise to be a great weekend and I look forward to welcoming visitors to Cookstown”. “The three day event, provides the opportunity for visitors to visit Cookstown and experience the continental market and Cookstown’s unique retail offering by a visit to our town centre shops, within our new look town centre. The continental market is brought to Cookstown via Marketplace Europe and takes place along William Street in Cookstown town centre on Friday 2 September (9am – 8pm), Saturday 3 September (9am – 8pm) and Sunday 4 September (1pm - 5pm). Photo Caption: Chair of Mid Ulster District Council, Councillor Trevor Wilson, Alan Hogshaw and TP Sheehy from Cookstown Chamber of Commerce, and Olivia Heagney from Brown Sugar.